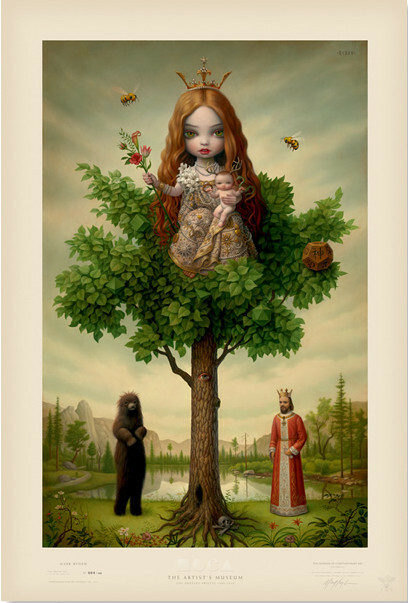 Mark Ryden is considered one of the kings of what is known as pop surrealism – an inimitable master of both his craft and his imagination. As a painter, Ryden’s aesthetic draws on many classical and traditional sources from Ingres, David and other French classicists to Little Golden Books. Ryden also draws his inspiration from anything that will evoke mystery; old toys, anatomical models, stuffed animals, skeletons and religious ephemera found in flea markets. Famed for his depictions of meat, blood and wide-eyed young girls, Ryden mixes wonder, nostalgia, beauty and classic icons. 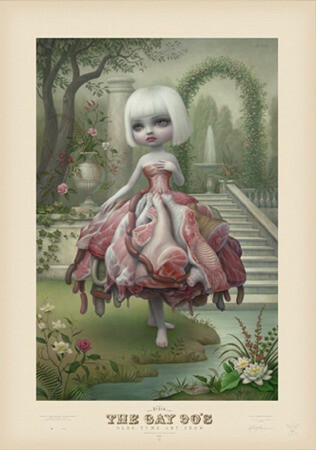 Ryden’s latest exhibition was with the Michael Kohn Gallery in LA, titled “The Gay 90′s West”, featuring old and new painted and sculptural works, including his famous painting of “The Meat Dress” (made popular by Lady Gaga) titled “Incarnation” – the print of which can be purchased below.